Today I have a review for you! I wanted to write this review a long time ago, but I never found enough time or inspiration. In this post I will review 24 pc set of 2 way nail polish liner brush from Born Pretty Store. 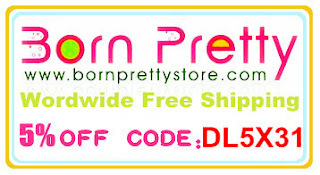 Born Pretty Store is a well known store that sells nail art related items with very reasonable prices and excellent quality, but you all probably know that. I bought this set quite a while ago, because I wanted something like this for a very long time, and since I finally got my Visa card, I decided to buy them, and I must say that I don't regret my desision =). In this set you can find a variety of finishes and colours. I was very surprised when I found 3 neons inside =), but there are also pretty glitters, good shimmers and I just LOVE the gold, bronze and silver. They are really well pigmented and really metallic like. Each also has a striper. Brushes are really thick, but they can draw a very thin line! I was really impressed! I also played a bit with them on the paper. You can see that they really can draw a thin line and the part with pen is also very precise, great for drawing details and really easy to use. And jut take look at the pigmentation of that neon green, I was really impressed since neons are know for being quite unpigmented. My favourite is definitely the last one, the one with rainbow was a BIG fail, but I had to share it with you also. They are definitely a must for every girl that likes doing nail art. And they are really easy to use and each plastic tube contains quite a lot of polish so they will last like forever =). If you do run out you can still pour in the same colour =). I would definitely recommend them to you! - Glitters don't get come out on the side where the pen is, but just coloured polish, but they are still awesome stripers! You can get them at Born Pretty store here. The set costs 24.55$, but the owners were so kind to offer a special 5% off code for all of my readers! So with my code you can get them for 23.38$, so each costs less than 1$. These look really cool. I'll have to check them out.